Buddleia spp. is a native to China. Buddleia x ‘Honeycomb’ is a new introduction from UGA’s Mike Dirr it is everblooming with fragrant orange-eyed deep yellow flowers and performed outstandingly in the field trails held at University of Georgia. This variety is a cross between B. davidii and B. globosa and performs great in sunny, hot sites and it can definitely bring a little sunshine into any garden! The branches arch and have narrow cone-shaped bunches of flowers on the tips of the branches. The flowers attract butterflies that feed on the highly scented nectar occurring in late summer or early fall. 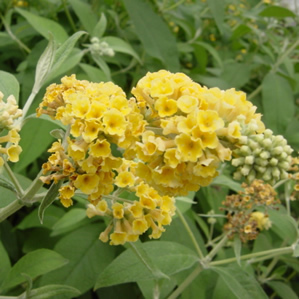 Honeycomb Butterfly Bush can reach over 6 feet tall with an equal spread. It is recommended that this plant be pruned in late winter to encourage shoots coming from the bottom of the plant. These canes are usually stronger and produce larger flower heads.